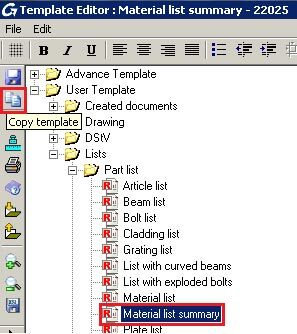 In Advance Steel user-defined material lists can be created from existing BOM templates. The first step is to copy an existing template and rename it (in this example: Material list summary is renamed My Material list summary). After confirming your selection by clicking "OK", a new list is created. The list becomes immediately available and can be later modified. Click in the field with the GRAITEC logo. The source file of the logo will appear in the bottom left part of the BOM Editor, in the "Image" field. By clicking the button with the 3 points, Explorer will open. Select the corresponding directory with the new logo and confirm your selection by clicking "OK". The new logo will be inserted. Note: All normal image formats can be used. The files should not be larger than 200 KB. Click the "Company" text field and right-click to open the contextual menu. Then select "Content". Since the text field starts with the "User Text" property, the desired text can be inserted in the corresponding field (e.g., company description, address, contacts, etc.). By confirming the inserted information, the new text will appear in the material list templates. New text fields with additional information can be inserted in the header of the list. Use the command for inserting a new text field by clicking the button from the left side of the BOM Editor. You can place a new text field in the header of the list by tracing a rectangle with the mouse. The coordinates in "Location" refer to the upper left corner of the text box. The coordinates can be overwritten, and, thus the text box can be later modified. 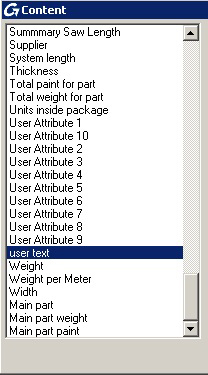 Correspondingly, the width and the height of the text box can be modified by overwriting the values in the "Size" row. Click in the new text field, then right-click and go to "Content" to select the information that will appear in the text box. The steps with errors can be undone by pressing < Ctrl> < u >. 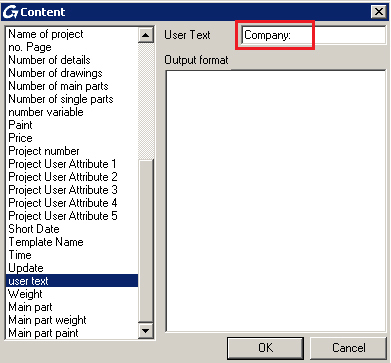 Follow the same steps as when inserting a new text field. When introducing a new column, the required space must first be created. This can be done by reducing the size of the existing columns and by merging the existing columns in the "Location" field. 1 = In this case new text fields must be inserted. The text that will be inserted will be user-defined. Right-click and select < Borders > to set the borders of the text field. Each page border can be selected individually. 2 = In "Detail", by right-clicking and going to "Content", the corresponding information can be selected (in this example, Painting). For the content of the "Detail" area, several options are available (see the Appendix). 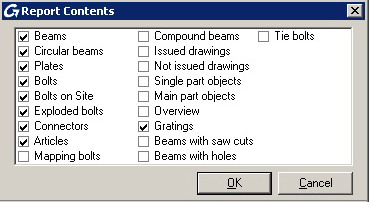 In addition to the visual adjustment of the list, it is also possible to add or to remove objects of the model from the list by using the "Report Content" function. This can be done by selecting or unselecting the corresponding options. 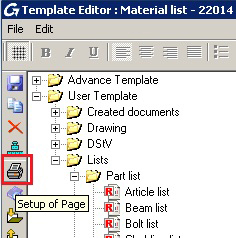 To access the dialog box, click the button from the menu on the left side of the BOM Editor. Each list is provided with predefined sorting. To modify the existing sorting or to change the importance of the elements, go to the "Detail" row and right-click. Then, select "Sorting" from the contextual menu. 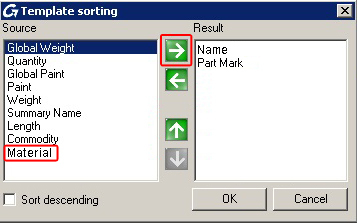 The left area of the window contains variables defined as sorting criteria. 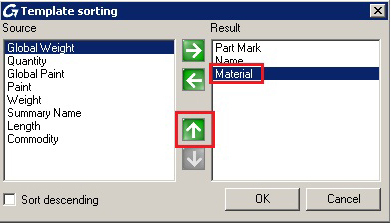 The corresponding criterion (for example: material) will be selected and moved to "Result" by clicking the "Right Arrow" button. By clicking the "Up Arrow" button, the criterion becomes more important (for instance, the second in importance after "Name"). 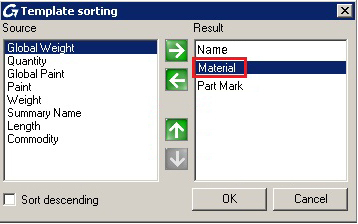 The newly created sorting criteria will sort individual elements from the lists by name, quality of the material (S235 before S355) and part marks. To confirm the selection click < OK >. By clicking < Save template >, information is saved in the user-defined list. 1) ReportHeader: (List header). The fields appear only on the first page of the list. 2) PageHeader: (Page header). The fields appear at the top of each page of the list and under the header of the first page of the list. 3) Groupheader X: (Header of the group X). A group header can be used for structuring a list. 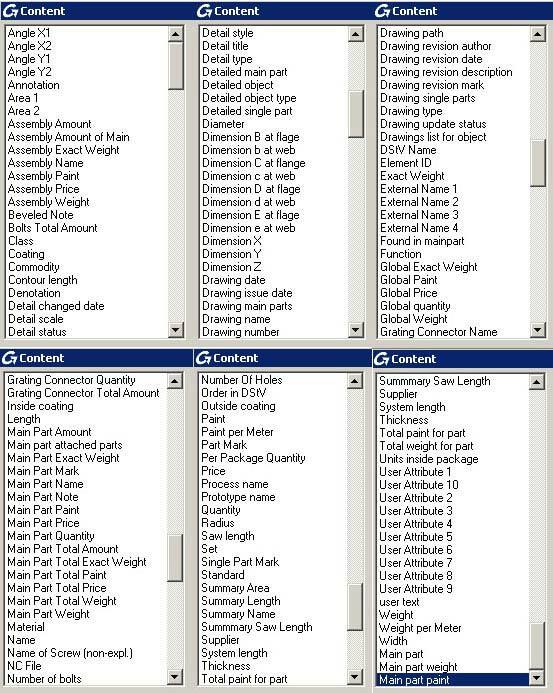 The easiest way for structuring it is by sorting it after main parts (see template - structured BOM). 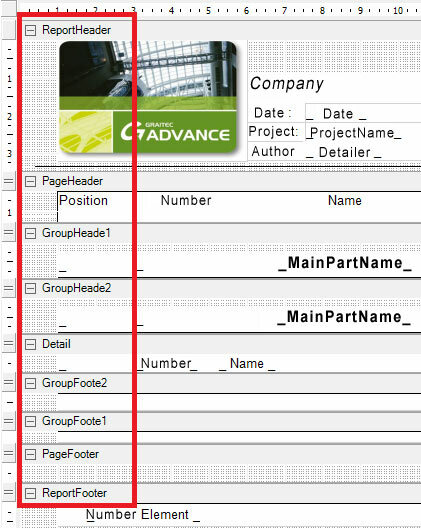 It is possible to define several group headers. Right-click in the GroupHeader area and, then, "Add rows...". A group header requires a corresponding group footer. This way a new structure can be added to the lot. 4) Detail:	 (Part Lists). The elements from the model corresponding to the selection are listed here. 5) GroupFooter X: (Footer of the group X). This row represents the ending of a group. In the group footer certain calculations of the group are possible. 6) PageFooter: (Page footer). This row appears at the bottom of each page of the list. 7) ReportFooter: (Footer of the list). Numerous combinations of the parts described above are available.